After a short time away, I am now back with the team at Merrifield Real Estate to work on my 40 + years of experience in the industry. 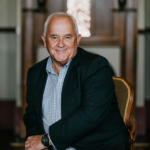 During this time, I have had extensive selling and management experience in all aspects of real estate including two years selling prestige properties in Perth. I currently hold a Real Estate and Business Agents Licence and have vast experience in sales of prestige properties and have previously held the top two highest residential sales records in Albany. My experience is with business management, sales of development land, residential, commercial, industrial and subdivisions, as well as strata and commercial management and rural sales of broad acres and hobby farms. I have specialised in premier properties and enjoy selling all aspects of real estate. Over the past 40 + years, I have seen many ups and downs in the industry and have seen and been involved in the many changes in marketing with the listing and selling processes throughout. I am happy to offer advice on all questions you may have on your property if you are considering selling or buying in the future, especially regarding the use of social media in the industry. Furthermore, I can offer advice on the new and exciting methods and processes used in the industry to achieve the best buy locations and the methods in which you can attain the best and highest price when selling your property. I look forward to meeting with past and new clients and helping them with their real estate needs. Experienced, well versed in what both parties wanted/required - Professional. Kevin, a man to be trusted. Thanks for all your good advice, hard work & helpfulness. Also with your confidence we knew it would come up with the deal. Kevin Marshall was 'Exceptional', his patience with my requests to lock up the house like a fortress after every viewing was always maintained. 2.5 years and hundreds of views!! Thank you Kevin for all the laughs along the way. Very straight, went the extra mile, calls after hours, found agistment till take over. Kept asking if all was ok. Very easy to deal with. Our needs were fully understood. The marketing situation was explained. We are grateful for the patience.